This recipe comes from “A Grandfather’s Lessons: In the Kitchen With Shorey” by Jacques Pépin. This dish goes back to my days of working at the Howard Johnson Commissary in Queens Village. The commissary turned out tons of hot dogs, among many other products, and I had fun preparing them in unconventional ways: sliced in stew with beans or in soups, in salads with a mustard sauce, or with cabbage. I do not remember exactly how we invented the “curly dog.” It involved cutting the hot dogs in such a way that they curled as they cooked. Each dog is cut halfway through lengthwise and then with about 12 crosswise slits, so that when it cooks in a skillet, it curls into a “dented” wheel. I knew Shorey would enjoy making curly dogs with me. The relish I serve with the dogs is a bit tart and uses dill pickles because Shorey loves it that way. I like pork and beef hot dogs, but any hot dogs will do. Only one hamburger bun is used for both of the hot dogs, half a bun for each curly dog to sit on, and the centers are filled with the relish. With a sharp paring knife, cut the hot dogs lengthwise about halfway through the meat. Then make crosswise cuts in each one, spacing them about 1/3-inch apart and cutting about halfway through the meat; you should have about 12 cuts on each hot dog. Heat the oil in a sturdy skillet. Add the hot dogs and cook over medium heat for about 3 minutes, shaking the pan so the hot dogs roll over and brown on all sides. They will start curling up into wheels. Meanwhile, toast the bun until it is crusty. Place a curly dog on each bun half, curling it into a wheel. Spoon the relish into the centers and serve. Combine all of the ingredients in a bowl. Cover and refrigerate until needed. To see how it’s done, go to SurLaTable.com/JacquesPepin. 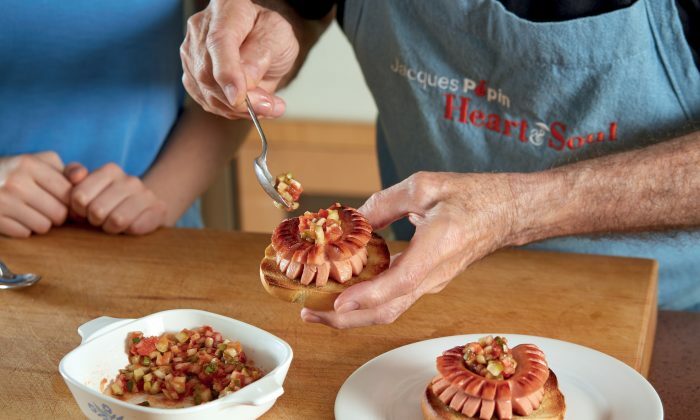 Reprinted from “A Grandfather’s Lessons: In the Kitchen With Shorey” by Jacques Pépin. Published by Rux Martin/Houghton Mifflin Harcourt.